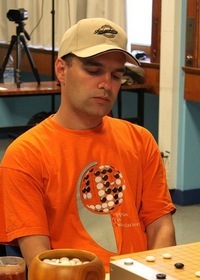 Dinerchtein became a professional shodan with the Hankuk Ki-won in 2002, 3-dan in 2008. Alexandre offers one-to-one and group lessons via Skype on KGS and DGS, simultaneous games and live commentaries for tournament organizers. San-ren-sei his website dedicated to teaching this fuseki. Recently, he created much more on the internet. Firstly go-sensations in 2009, which highlights major games from servers like kgs, igs, tygem, dragon , etc. Followed - early in 2010 - by a pro-version 9dan.com of it , which focuses on major games from several world title events, like Ing-, LG-, or Fujitsu-Cups. In the same time he had worked also on baduk.pro - his alternative as a social site (but only for the go community) to Facebook, which was launched in March 2010. Soon, it gained several 100s of members. His name (Александр Динерштейн) is also transliterated as Alexandr Dinerstein or Alexander Dinershteyn, but "Alexandre Dinerchtein" is the form he seems to use himself. Charles That's a Cyrillic romanisation based on French pronunciation - there are very traditional reasons for it. Robert Pauli: Why not plain Alexander Dinerstein ?? According to usefulenglish, Alexander is just as good as Aleksandr. Alexandr isn't even mentioned. And if you look up the Russian rulers, you'll find six Alexander and not one Alexandr. Or what about Alexander Pushkin or (German) Alexander Solschenizyn (the footnote in the English version to Aleksandr there reads: often Romanized to Alexandr or Alexander) ? Concerning the surname, there are hundreds of Dinerstein on geni, not one Dinerchtein. Neither do you find Dinerchtein on hebrewsurnames, only Dinerstein. According to jewishgen, both variants share the Daitch-Mokotoff Soundex 369436 as well as the NARA Soundex D562. And you know what, German stein is English stone. Fits nicely to someone with his profession. Ancestry agrees: Yiddish diner shteyn is English thin stone, and that's German dünner Stein.